We were the only ones in the industry to offer a hotspot reducing AR coating. We have developed an AR coating that is centered in the infrared band to reduce reflections. 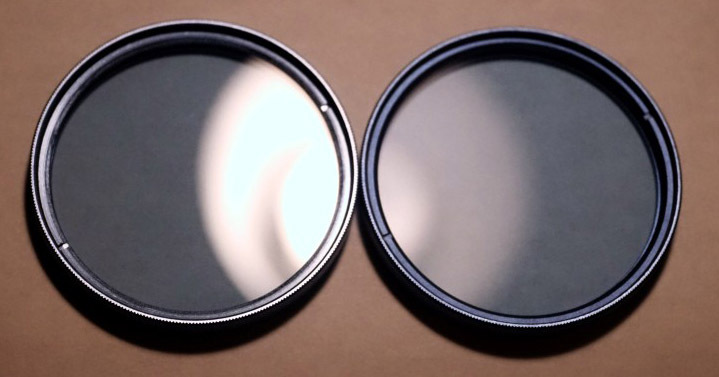 When applied to both sides of our conversion filters, we found that this coating can dramatically reduce hotspots, increasing the usable aperture range in most lenses. We have developed our coating to a high standard to avoid any trapped dust or imperfections underneath the coating layers to maintain our high standard of cleanliness. Even if your lenses don’t have hotspots, the AR coating reduces stray reflections, ghosted images, and increases overall sensitivity and image clarity. AR coatings are the standard for every optical surface in photography, but they are expensive and difficult to manufacture in small quantities, so our competition doesn’t bother. Uncoated glass has a reflection of around 7.7% at all wavelengths (about 4% when the light enters the glass, and another 4% when the light exits the glass), and we found that these reflections off the sensor filter was bouncing off the glass and reflecting back from the lens housing and aperture blades to contributing to the hotspots. 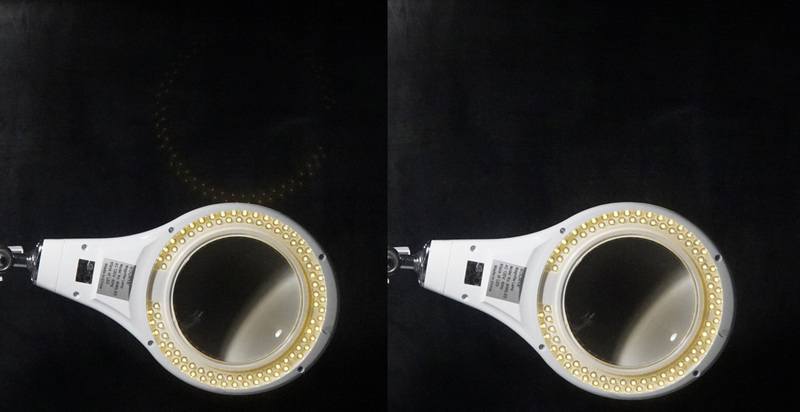 We developed an anti-reflective coating that is centered around the IR wavelengths that cause hotspots, and reduced the ~7.7% reflection down to <0.4% on average over the IR band, compared to our competitors coating which reduces <1.0%. Below, scan data from our sensor filter coating compared to uncoated glass. 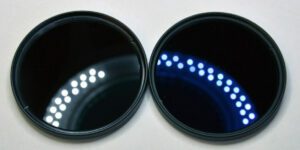 The coating does not reduce visible light reflections as much, and does not reduce blue reflections at all. This gives the glass we use a blue shine visually, since that is the only range that is fully reflected still. Left, uncoated IR glass. Right, AR coated IR glass. Shot with visible light. Same glass as above, shot in infrared. 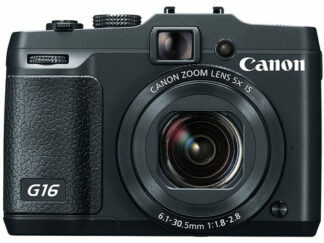 You can see the IR reflection is greatly reduced. When applied to our internal conversion filters, we find that hotspots are significantly reduced. 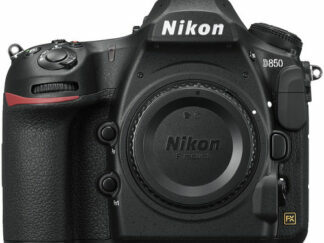 Below is a sample from a Nikon 50mm 1.8 which has a strong hotspot at small apertures. Independent tests also available from Mark Hilliard here and Edd Noble here. It is important to note that while sensor reflections contribute to hotspots, reflections off the lens barrel also play a role, and AR coatings cannot reduce all hotspots. 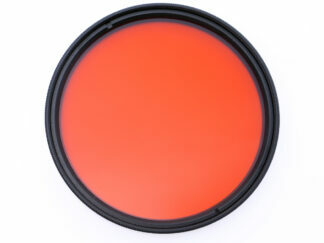 We also now offer our AR coatings on our IR filters and hot mirror filters. The AR coating reduces increases transmission and reduces reflections and ghosting. Example below of one example of a filter reflection artifact. Left, shot through an uncoated IR filter, right, shot through AR coated IR filter. 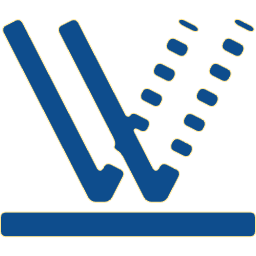 Please note, the lens filter AR coatings do not have an effect on hotspots.